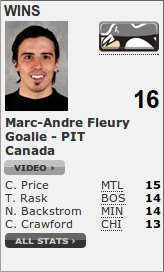 - MAF solid and unlucky on the Ovie goal (Hit Nisky's backside dropped to his stick), otherwise might of been a shutout. Holtby was great, but MAF better. - Bennett had a nice hit and was more physically involved than his early games, he's a keeper. - Pens played smart, ignoring the little shots on Sid which is the right way to play. - 10 game winning streak in each of the last 3 seasons, a new NHL record. - PK faceoffs were not good. Adding Sid helps the PK so much in that respect. - Ovie is not the player he used to be. I think its his conditioning? -Bylsma sounds like he is breathing through an iron lung during his press conferences. Last edited by jwest21 on Wed Mar 20, 2013 9:14 am, edited 1 time in total. Every time Niskanen's been asked to step up due to injuries, he's done so - even going back to last season. tfrizz wrote: Every time Niskanen's been asked to step up due to injuries, he's done so - even going back to last season. Niskanen is a lot better player than most of us here give him credit for. Posts like that bother me. Niskanen is a solid second pairing defenseman. It seems like almost everyone here thinks he is exactly that. Holtby played well; 30 + shots and only 2 goals. The defensemen played great on the 4 min PK. I thought 2 favorite whipping boys played outstanding: Brooks and D Engellend! I loved seeing the old school CAPS jerseys! Being extra close to the ice;six or 7 rows; what skill. Hockey truly is artistic and brutal all at once. Slow, steady, march to the top! I still wish Joe V got more ice time. I don't understand DB's hatred for him. I hope he doesn't get the ax when Malkin returns. Glass is borderline useless in my opinion. Looks like Ribeiro could have ended Sid there cleanly and held up. Under the current rules that would be heavy suspension for a blind side hit. The best part about these types of wins is not just that they're playoff brand defensive hockey games, but that the pens simply aren't allowing themselves to get suckered into the behind-the-play stuff that Philly used to end their season last year. Took some time, but they appear to have finally figured that out. Someone should tell Flower that Tanger wasn't there. Poor guy. - Another day at the office for the Pens. - Neal looks lost out there without his setup man. - Kunitz has cooled down lately but mostly because teams can now focus solely on that top line. - Flower was sharp.. hmm maybe this 2 goalie thing is working? - Crowd at the CEC was very audible. to you! sil wrote: The best part about these types of wins is not just that they're playoff brand defensive hockey games, but that the pens simply aren't allowing themselves to get suckered into the behind-the-play stuff that Philly used to end their season last year. Took some time, but they appear to have finally figured that out. This is why I'm looking forward to Sunday's game. Let's see if the Pens can "get to their game" for 60 mins against those clowns. It's been a long time coming. Ove needs his roids back. Last edited by SoupOrSam on Wed Mar 20, 2013 10:22 am, edited 1 time in total. If they get past Philly without getting sucked into it, it'll be progress. This Paul Martin guy we brought in this year is a complete stud. Much better than the Paul Martin we apparently cut after last season. That guy was a loser. That's awesome. Taking superstition to a whole new level. Is this a team peaking too early, or a team that is learning what it takes to win any type of game? I think it is the latter. They have too much skill to peak, as long as they work hard and comply to their system I think the sky is the limit. MarioLives wrote: Is this a team peaking too early, or a team that is learning what it takes to win any type of game? I think it is the latter. They have too much skill to peak, as long as they work hard and comply to their system I think the sky is the limit. Reminding me a lot of last year. I think they are peaking too early. I'm getting ready to go on rants about how they're going to cool off before the playoffs and flounder out of them, just like I did last year. Its not good. Hopefully Letang and Malkin return to the lineup and round into form in time for the playoffs to start and they can keep things rolling. If they were peaking, I would think they would be winning games by more than 1 or 2. A team without Malkin and Letang is peaking? That's a pretty curious analysis. Pens lose 2 or 3 in a row? PANIC! Pens go on a winning streak? PANIC! when did winning a bunch of games in a row automatically become a bad thing? Froggy wrote: Pens lose 2 or 3 in a row? PANIC! When the playoffs are approaching, they last 2 months, and you have an understanding that a team can't stay hot for a third of a calendar year.